A NEW culture is capturing the imagination of today's youth! And few seem to see it for what it really is — a revolutionary set of ethical, moral, and political values. Current writers and commentators often refer to it as the "drug culture" or the "hip culture" in their attempts to define this new way of life which seems td be so attractive to today's youth. Many of the "older generation" are slow to realize that it is not just an interesting fad or trend — to be compared with goldfish swallowing — but a near total rejection of all of society's cherished norms and values. This new "way" is designed to replace — even to destroy — the "establishment." To be sure, a remarkable culture does accompany the drug scene. It has its own strange vocabulary, unusual styles of dress and appearance, totally different standards and values, shockingly new living arrangements — hardly anything remains unchanged! The goals, purposes, motives, and ideals take an entirely different direction. It's a world all its own! But is it right? Or more pragmatically, does it work? In adopting a new standard of cultural values, has today's youth been wise to totally reject the old? Was there nothing worth saving? Nothing of true and lasting value? And how does rejecting accepted cultural and ethical values differ from outright degeneration? Has any refinement, any true culture been preserved or created in this new "culture"? Filthy living conditions, slovenly personal appearance, disease of many kinds, gross immorality are all commonly accepted as proof that the "establishment" has been rejected. But is personal degeneration the only way to reject the evils of the "establishment"? Surprisingly, the Bible teaches the rejection of many of the world's values, too. "Love not the world..." Christians are admonished in I John 2:15. And "whosoever... will be a friend of the world is the enemy of God" (James 4:4). But does this amount to the same total destruction of all established values of today's world? Should Bible professing Christians become dropouts from society? Not at all! Understand why not! Jesus Christ rejected the false values, the injustices, the hypocrisy of His day. So did His disciples. Christ and His followers refused to accept or follow what was wrong in the world. According to what standard? God's Word! "Man shall not live by bread alone, but by every word that proceeds out of the mouth of God," Jesus said in Matthew 4:4. But the founder of Christianity had no argument with cleanliness, hard work, and true values in every part of life. The Bible reveals that God loves and promotes right culture — the Bible is literature, it exalts the role of good music, it gives the guidelines for a balanced, refined, and cultural way of life, a way of life totally different in almost every respect from that of many youths today! This way of life is being pioneered at Ambassador College by hundreds of young adults from many divergent backgrounds. 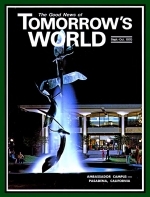 In establishing this unique college, the founder, Mr. Herbert W. Armstrong, adopted the motto "Recapture True Values." He recognized that the world was full of differing and conflicting values and ideals — some true, some false. He had the wisdom to see the need for sifting and sorting — for recapturing the true and rejecting the false, but not for rejecting everything without careful examination and testing. Again, according to what standard? Human reasoning, which says, for example, if it feels good to you then it's right for you? NEVER! He used the same standard that Jesus Christ used — the Word of God! — to which practical, positive experience has now been added for some twenty-three years in Ambassador College. Experience has proved what God's Word guaranteed — that the right way of life for young people has character, highest morality and virtue, cleanliness, industry, refined cultural values — and a great purpose in life: active participation in this worldwide Work of God, commissioned to save this world from utter destruction! The three campuses of Ambassador College are cultural centers with a quality way of life. They are uplifting, inspiring, elevating! Not degenerate, base, and demeaning. Do they get right results? You bet! God's way of life for young people produces happiness, accomplishment, success!! It eliminates heartache, depression, disease, and death! The right way of life produces young men and women of true culture. Those of you young adults who have the courage to reject both the evils of the "hip scene" and the evils of the establishment — and want to do something about both — should consider applying to Ambassador College. It continues to be a remarkable fact that about 50% of our entering coeducational class have attended other universities, and about 20% have already graduated at the Bachelor's level or higher. We can send you a copy of the Ambassador College catalogue and admission application upon request.